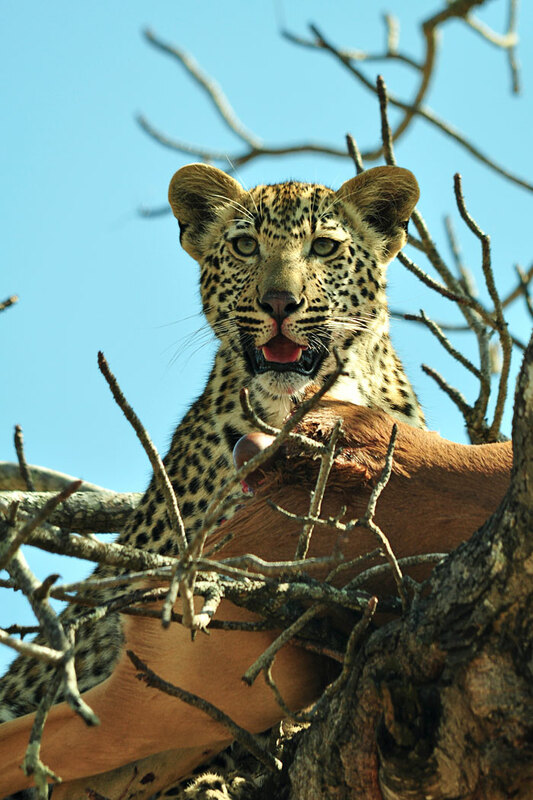 The Campbell Koppies female leopard is sighted with an impala kill which she proceeds to hoist into a Marula tree. 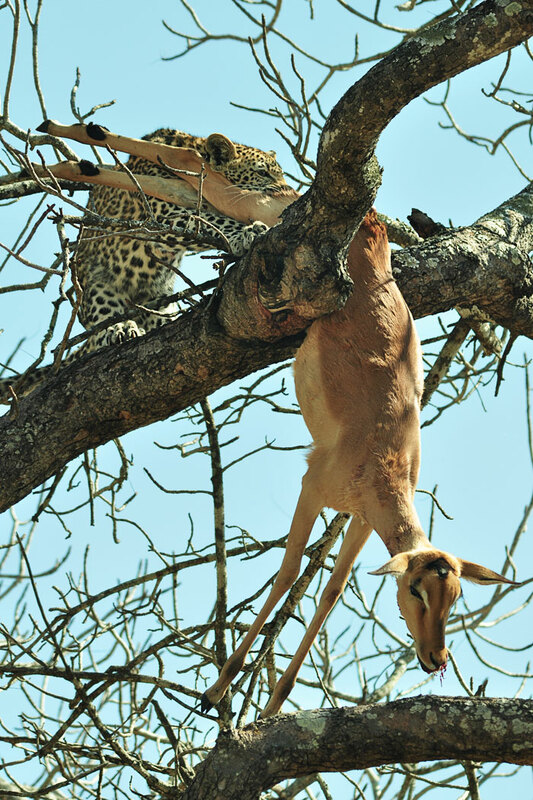 Judging from the skin tears on the impala's rump, the leopard began eating her on the ground before deciding to hoist into the safety of this nearby tree. 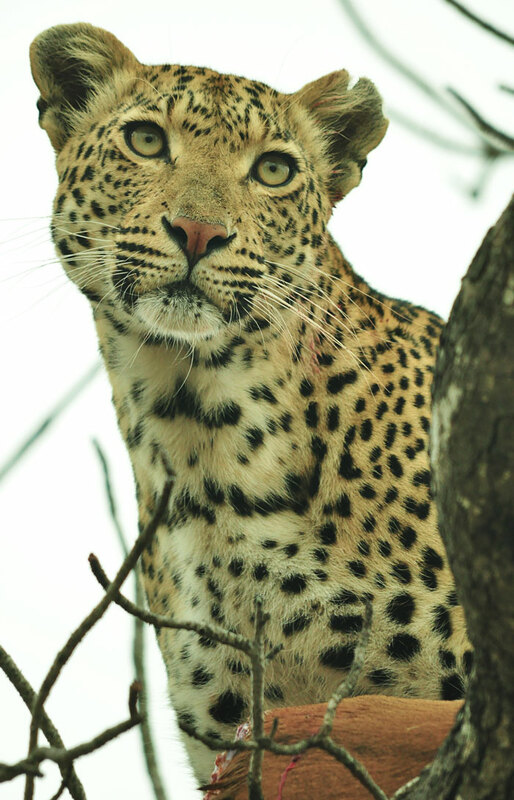 After a brief bout of eating, she looks up and calls softly into the bushveld. Persistent and resonant, her calls are undoubtedly directed towards her cub. Seconds later she spots movement in the dry grass and descends the tree to investigate. 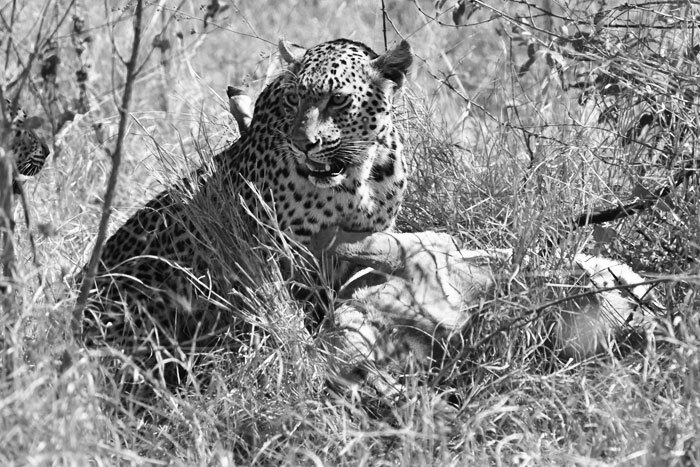 A young leopard sidles out from behind a guarri bush searching for the reaffirming contact calls made by his mother. 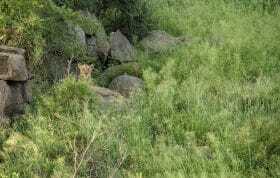 The Campbell Koppies female and her cub are reunited. Ever alert to potential signs of danger, especially around her hoisted carcass and with her cub around, she keeps a wary eye out. Predators tend to get very thirsty as the blood dries in their mouths after feeding. As a result their tendency to drink shortly after eating is not uncommon. Having satisfied their thirst, they will often return to the carcass to feast on the remains of the meat. 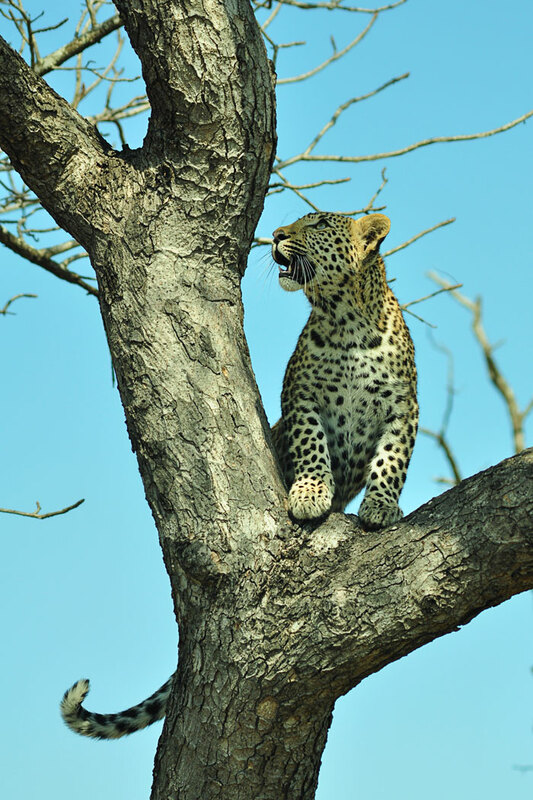 It is always wonderful to see a young leopard climbing up a tree. 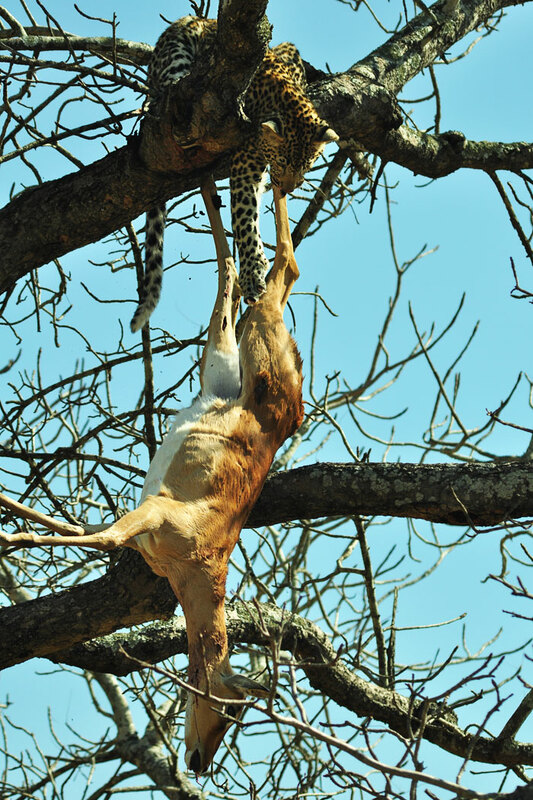 At times agile, yet occasionally clumsy as well, young leopards will need to constantly practice climbing before they get confident and strong enough to hoist carcasses on their own. 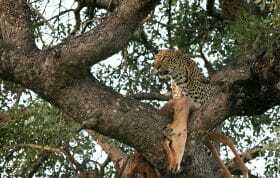 The young cub, halfway up the tree, was now preparing for the second leap up to the carcass. The young cub pauses mid feeding to look around. Having left his mother at the base of the tree, he had the carcass all to himself. 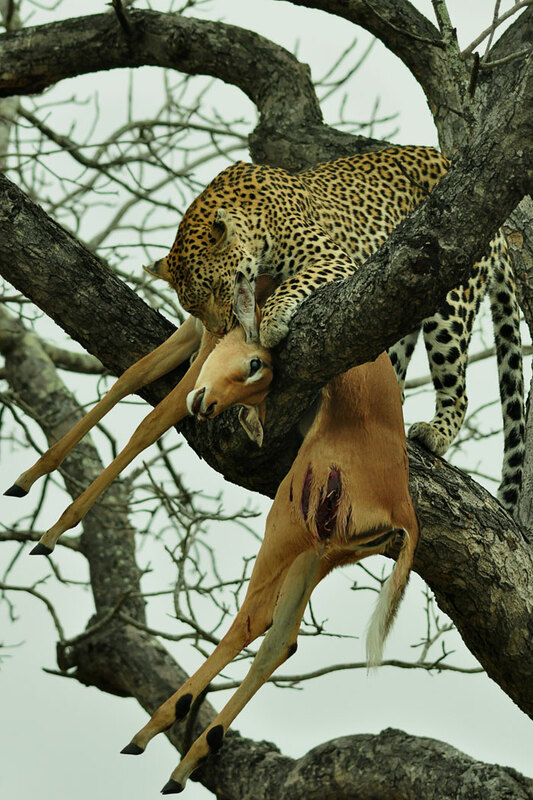 His inexperience, however, started to show as he began to move the carcass around with disastrous results. Having shifted the carcass around a little too much, it soon began to lose its holding position and slide downwards away from the young cub. Digging the claws on his back paws into the branch of the tree, he did his best to yank it back, yet the weight of the impala was simply too much for him. 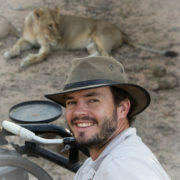 Trying desperately to cling onto the dangling impala as it slips out of his claws, the cub could not catch it in time. Moments later, it crashed through the branches before landing in a heap on the ground. With an angry growl the Campbell Koppies female shows her annoyance. She now had to re-hoist the carcass and then let her inexperienced son try again. what a great series of photos and story telling. Fantastic and thanks heaps. Amazing photos! 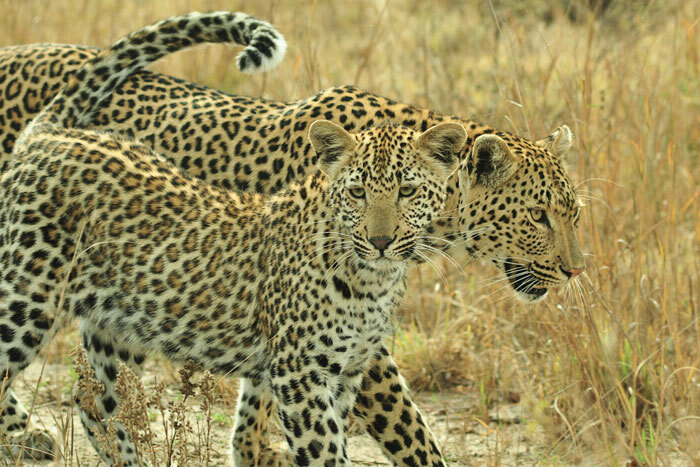 Lovely to see the leopards thriving! Thank you! 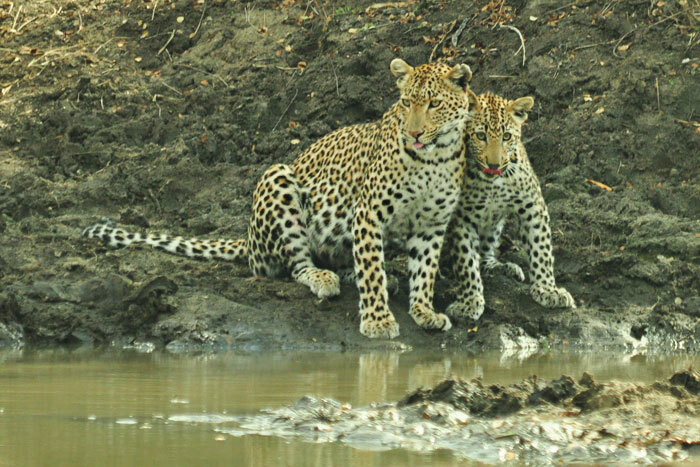 Great photos..and wonderful narration.. thanks for a peek into the lives of this wonderful leopard and her son. Lovely images and only serves to make me yearn to return to Londoz! I should be there again in December. What a comical little adventure, and a great series of images. absolutely beautiful. The cubs tongue is still so red! 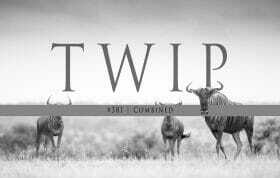 makes me miss the sounds, smells and sights of the bush on a daily basis. 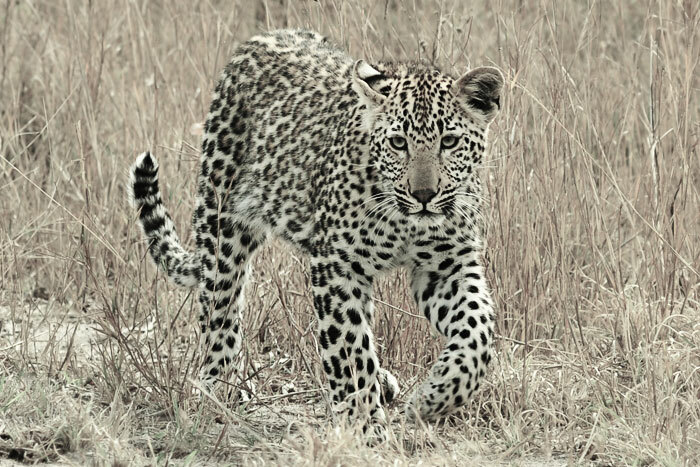 Here’s to a happy weekend, filled with amazing sightings and a great appreciation for the bush. One of my greatest mornings in the bush. Starting with the actual kill and hoist through to the fetching of the beautiful cub and finally watching him climb and drop the carcass and receive a very good disciplining! 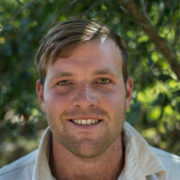 Lets hope we start seeing the Campbell koppie female on a more often!